Back in New York City for the summer and spent the first couple of weeks settling in. Every neighborhood here has it's own culture and personality. If I permanently made NYC my home then I would take residence in the West Village. I can wander around the tree-lined streets, or sit at one of the many charming cafes for hours. I prefer people watching over perusing magazines for style inspiration. I'm like a kid at a toy store in this neighborhood as there is so much to see. Particularly individual style which is what makes this city so inspiring. I make it a point to hit up every vintage store everywhere I travel. It's the only place you can find truly unique pieces. This vintage shirt is light and sheer making it perfect for summer. 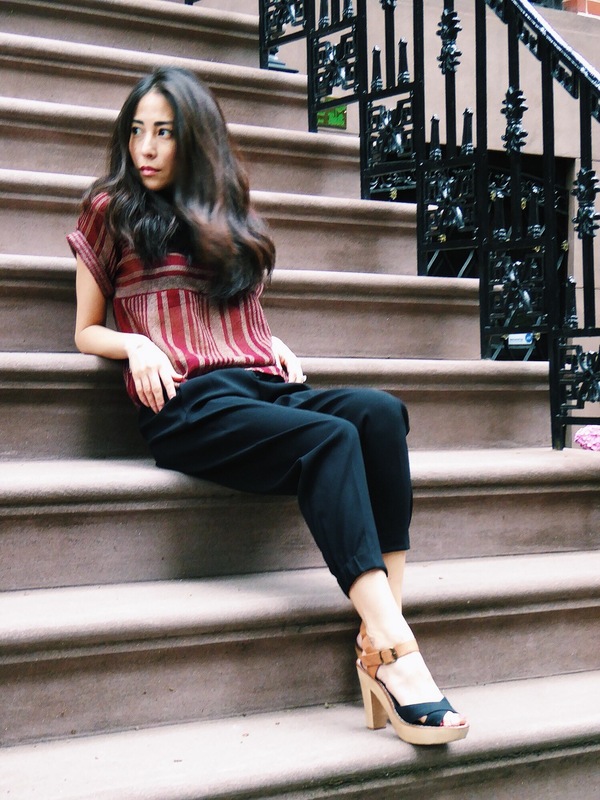 I paired it with my current faves--the Dexter pant from Aritzia and wooden sandals from J Litvack. I'm so happy to back in my favorite city on my favorite coast!